Technical Specs: NEW 2K scan of the interpositive,NEW slipcover (guaranteed for three months after its original release date),The newly-commissioned front-facing artwork from artist Justin Osbourn (Lifeforce, The Fog, Child's Play). The reverse side of the wraps will showcase the original theatrical poster art. NEW Mirror Images – an interview with Special Effects Creator John Caglione, Jr. Sometimes it takes a couple sequels before a studio finally realizes a franchise is dead. It took 'Jaws' three sequels. 'Batman' needed three before it got rebooted. 'The Terminator' is onto its fourth and apparently final outing. But then you have horror franchises that seem to go on forever like 'Friday The 13th' or 'Halloween' before they're remade and get a dozen more sequels. In the case of 'Poltergeist,' a mystifying trip to 'The Other Side' should have been the end, but apparently the ghouls haunting poor Carol Anne needed to pop by Chicago to take in a Cubs game, a quick private tour of the Field Museum, and possibly do a little shopping at Water Tower Place before deciding enough was enough. 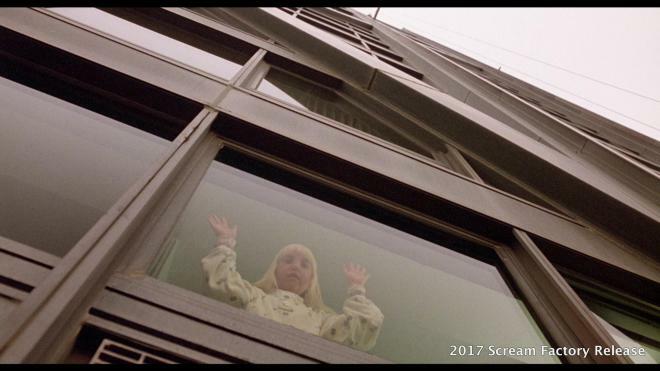 Sweet little Carol Anne Freeling (Heather O'Rourke) has seemingly moved on from being terrorized by spirits who want to sap her life essence, but at the same time, her experiences have left her a bit scarred. Her dreams take her back to dark places so she's been sent to Chicago to live with her Aunt Patricia (Nancy Allen), Patrica's new husband Bruce (Tom Skerritt) and his teenage daughter Donna (Lara Flynn Boyle) while Carol Anne attends a school for gifted kids. School life is a bit of a drag and totally lame (I'm trying to reconnect with my forgotten 80s lingo) for Carol Anne. The kids somehow know about her haunted encounters and tease her endlessly making them total dweebs, and the head schoolmaster Dr. Seaton (Richard Fire) treats her like a sideshow freak to show off to his colleagues. Unfortunately, Carol Anne and her family's experiences on "The Other Side" didn't stop the evil Reverend Kane (this time played by Nathan Davis) from finding her. Slowly he gains his power back in order to capture Carol Anne inside the "mirror realm" once and for all. 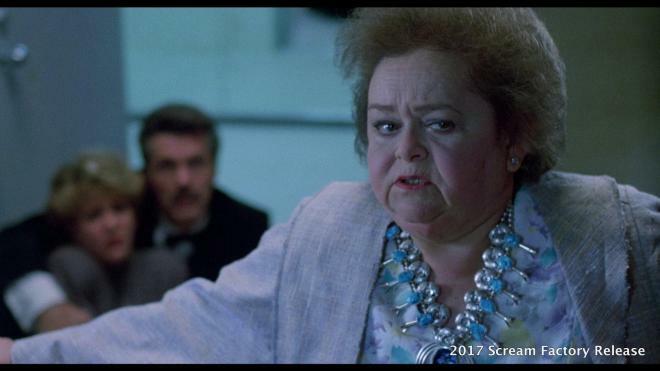 Thankfully stalwart psychic warrior Tangina (Zelda Rubinstein) picked up on some bad vibes and has rushed off to Chicago to help Carol Anne put an end to Kane and his evil once and for all. As Kane captures Carol Anne's family one member at a time, Zelda may be too late to save Carol Anne and put an end to Kane's evil. 'Poltergeist III' is one of those legendary movies from the horror franchise-addicted 80s that just should never have been made. By the end of 'Poltergeist II' the story had been wrapped up pretty sufficiently. "Vomit Monster Kane" had basically been destroyed and the Freeling family was happy and healthy. As the second film was already stretching things to justify its existence, this third entry doesn't even bother to try. How does Kane return after seemingly being destroyed? All we're given from Zelda Rubinstein's Tangina is that "He's found her again!" before the woman scampers away from afternoon tea to save the day. Added to its obvious cash grab woes is the fact that only two actors, Zelda and Heather O'Rourke even bothered to return. When Craig T. Nelson says he's had enough, that should have been taken as a sign at the studio level not to continue. Heck, even Jerry Goldsmith refused to come back to do the score! Then you have the recasting of Kane after the untimely death of Julian Beck. 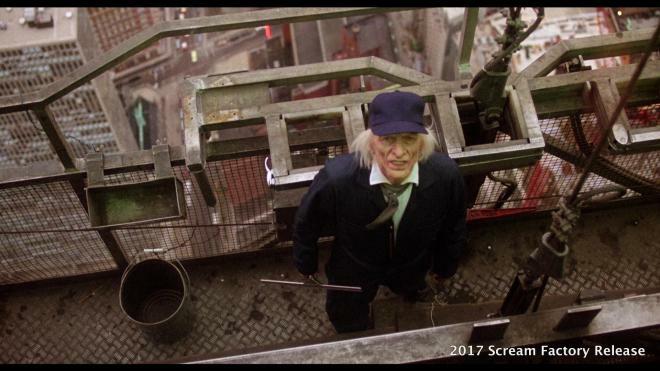 Beck was the sole reason 'Poltergeist II' was even remotely creepy. His being replaced by a look-alike with pancake makeup and then having that actor be dubbed by a sound-alike feels fake and just a bit disrespectful to the man's memory. The biggest problem with this entry is that it simply shouldn't have been a 'Poltergeist' flick. Had it just been a creepy haunted house movie that takes place in Chicago's Hancock Tower, that might have been something interesting and unique to see on screen. It's a creepy obelisk-looking building that stands apart from any other high-rise in the city and is the perfect location for a haunted house movie - much like how Cabrini Green was used for 'Candyman.' But sadly so much of this film takes place in a parking garage it never really feels like the building is much of a character the way the Freeling house was in the original. Additionally, with the slashed budget, this movie doesn't look or feel like a 'Poltergeist' film. The previous entries had large effects budgets that included practical makeup and optical effects. This one is all lights, smoke, and mirrors - which is cool and spooky at times, but when that's the only trick in the bag, it gets a little old after awhile. The best moment of the movie is when Donna climbs out of the Mirror Realm through Tangina's corpse, but that's only one highlight against the backdrop of a rather dull movie. Also a bit sad is the fact that this movie didn't even bother to invent a signature catch phrase like "They're here!" or "They're back!" to hook the audience with. That said, this movie is still a goofy bit of fun to watch. Don't get me wrong, 'Poltergeist III' is a bad movie, but it holds the place in my cinematic upbringing as the first 'Poltergeist' film I saw on VHS without having been edited for TV. So when I was about six or seven years old and I got to rent it, it was genuinely pretty spooky, but it really doesn't hold up well after all these years. On top of the film aging poorly, you have the added drama surrounding the continuing "Poltergeist Curse" with the unfortunate sudden death of star Heather O'Rourke. She was a young talent and a rising star who sadly never got to offer the world anything more than these three films and several television appearances. 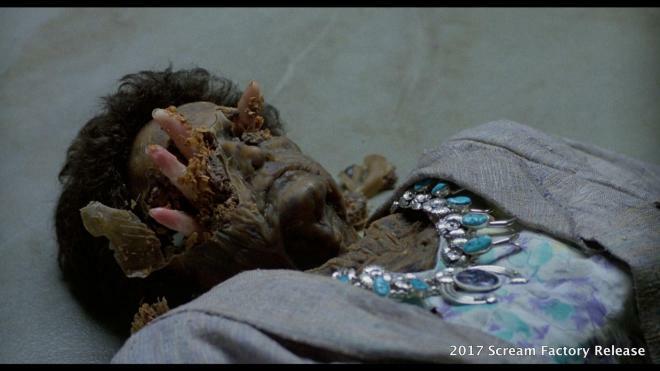 After 27 years and a few aborted attempts, 'Poltergeist' has invaded theaters once again with a new reboot starring Sam Rockwell (he's the dad, not the little girl). As that film failed to truly ignite the box office, maybe this franchise can enjoy eternity in peace. Not likely, but we'll see what happens in the years to come. 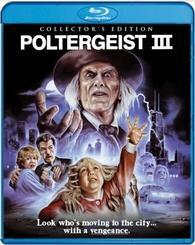 'Poltergeist III' arrives on Blu-ray from 20th Century Fox and MGM pressed on a Region A locked BD50 disc. The disc comes housed in a standard eco-friendly case and loads directly to the main menu. Note: 'Poltergeist III' also can come packaged with 'Poltergeist II' in double disc packaging. That disc is identical to the previous release from 2011. NEW 2K scan of the interpositive,NEW slipcover (guaranteed for three months after its original release date),The newly-commissioned front-facing artwork from artist Justin Osbourn (Lifeforce, The Fog, Child's Play). The reverse side of the wraps will showcase the original theatrical poster art. When the 2015 release of 'Poltergeist III' arrived from Fox/MGM, I was generally impressed with the 1.85:1 transfer. It wasn't an amazing looking transfer, but it certainly wasn't a travesty either. Colors may have looked a little pale, but given the Chicago winter location that was fitting and detail levels were generally pretty good. I honestly didn't think that there was all that much room for improvement. This new 2k scan does offer some subtle improvements. Those expecting obvious differences as were evident in the remasters for 'Carrie' or 'The Thing' may be a bit let down, however, they shouldn't be disappointed either. Finer detail clarity is improved, especially when looking at the makeup effects for Kane. Colors have also been touched up with blues being pulled away from the teal range, the image looks a little warmer, flesh tones have a healthier look to them, primaries have a stronger presence, Carol Anne's red Speak & Spell compared to her pajamas show some color separation. It's interesting how the colors vary between the releases, where in some scenes the Fox/MGM release would have a warmer tone, the Scream Factory release has a colder tone, where in some of the Fox/MGM release had a colder tone, the Scream Factory release has a warmer tone. It's not a blanket shift towards warmer or cold. Black levels are still inky and deep allowing the film to maintain a nice sense of three-dimensional depth. The print sourced for this film is also in better shape as it doesn't display any of the speckling or slight scratches during the opening credits as the previous release did. All around this is a pretty great looking transfer that is a slight improvement over the original release. If the 2015 release earned a 4/5 I'm giving this one a 4.5/5. The English DTS-HD MA 5.1 mix is virtually identical to the one on the previous release. You can read my comments on that below. Rolling a DTS-HD MA 5.1 track, 'Poltergeist III' sounds better than ever, and yet at the same time underwhelms with this audio track. On the plus side dialogue is crisp and clean offering plenty of separation from the various sound effects and composer Joe Renzetti's score to live. On that note, there just isn't much reason for this film to be a surround track. I'd wager 90 percent of the sound is stereo/center loaded. The surrounds are rarely (if ever) engaged. While the lossless nature offers some extra oomph around the scarier story beats, the track itself just doesn't impress me all that much. 'Poltergeist III' now also comes packed with a robust DTS-HD MA 2.0 mix that sounds newly remastered. All you have to do is hear the differences in lion's initial roar when the MGM logo appears. Dialogue in this new 2.0 mix is stronger and sounds more present throughout without any kind of interference from the score or sound effects. As a stereo mix, the film doesn't display the same sense of imaging and spacing as the 5.1, but I feel that it is better balanced. The dialogue comes through clearer without the fading effect that the 5.1 mix had that required you to adjust levels accordingly. I have a feeling fans will generally gravitate towards this new 2.0 mix. Audio Commentary: Director Gary Sherman and moderator Michael Felsher of Red Shirt Pictures engage in a pretty terrific audio commentary for 'Poltergeist III.' From the get go, Sherman details all of the practical effects work that went into this film making it an impressive technical accomplishment. He has some sweet and tragic things to say about Heather and her passing. There are a few gaps here and there, but otherwise, it's a pretty great commentary and one fans should really enjoy. High Spirits - Screenwriter Brian Taggert Interview: (HD 16:02) Screenwriter Brian Taggert provides an informative interview about the film, his long working relationship with the director and how they approached the film with an "Alice Through The Looking Glass" sort of theme. Reflections - Nancy Allen Interview: (HD 12:15) This is a very cool little interview as Allen discusses how the mirror tricks worked and all of the practical in-camera tricks were pulled off. She generally has some fond memories about working on the film and working with the cast. Mirror Images - Special Effects Creator John Cagligne Jr. Interview: (HD 12:47) This is a pretty fun interview as Cagligne details all of the practical effects they had to design for the movie including the infamous scene where Lara Flynn Boyle rips out of the rotting corpse. He also offers up some great info about the makeup work that was created to recreate the original Kane actor who had passed away before this film was made. He's got a funny few anecdotes at the end. Alternate Ending: (HD 2:50) The audio for this ending was lost so to fill the silence the score was used and subtitles from the script pages fill in the dialogue. The shots of Pat's family members frozen is a little haunting, especially the one of Heather O'Rourke, but otherwise, the ending isn't all that different or amazing. You can understand why it wasn't used when you see it. 'Poltergeist III' is just one of those movies that has it's fans and repels all others. I have some pleasing nostalgic memories of the film and I do get a kick checking it out every couple years. It may not hold up well for me after all these years, but I've come to know a number of fans of the film who stand by it through thick and thin. For those fans, this Blu-ray release from Scream Factory does the film justice. The new transfer is a notable improvement over the previous release and now with a remastered stereo audio mix in addition to the original surround mix - the film has never looked or sounded better. Add in some fantastic bonus features including the lost original ending, this is the disc to own. While I don't love the film, I do think it's fun and this Blu-ray release earns a solid recommendation from this reviewer.